The Board of Directors of Bishop Auckland Football Club is delighted to announce that an agreement has been reached with Motif8 Embroidery & Print Ltd to remain as the club’s kit supplier for at least the 2017-18 season, with an option to extend the arrangement for another year. 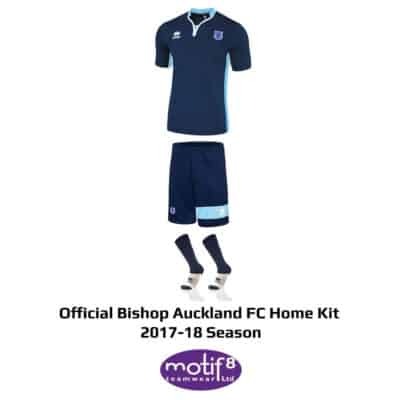 Chris Pomfret, Managing Director of Motif8 Embroidery & Print Ltd, added, “We are delighted to be named as the official kit supplier to Bishop Auckland FC for the 2017-18 season, a fantastic club that is heading in the right direction on and off the pitch, we wish all the Board, management and team all the very best for the new season”. Over the next few weeks, the Club will release details of the new main shirt sponsor as advanced discussions are currently ongoing. The Club will also launch the new 2017-18 playing kit, which will take place at Heritage Park during pre-season and will include the Club’s official photoshoot ahead of the new season. At this point we will also release details of how and where supporters can buy the new replica shirt well before the start of the new season. « Come and be volunteer at Heritage Park!